One of the striking aspects of the Asian market for someone steeped in the European telecom environment is the lack of visible paneuropean brands. Despite the protests of large European incumbents, the numbers don’t lie: 5 players in Europe capture over 90% of mobile subscribers and 60% of fixed broadband subscribers (source: annual reports, EU, BEREC, GSMA). Of these five, three (Vodafone, Orange, Deutsche Telekom) have European brand strategies with the same brand present in multiple countries. Finally, the same three are largely present on both fixed and mobile markets in multiple countries. On the face of it, nothing similar in Asia. With the exception of Vodafone, which operates the Vodafone brand in two of the three countries it operates in, there are no panasian telecom brands as such. But this apparent lack of regional consolidation hides a lot of underlying ties. There are in fact seven panasian conglomerates representing 36 major operators of the 87 we have counted in the region (excluding countries with a population under 1m and operators with less than 5% market share in either fixed or mobile but including national broadband networks). These are Axiata (8), Singtel (6), Telenor (6), Hutchison (5), Viettel (4), Ooredoo (4) and Vodafone (3). A number of things are interesting to note about these players: first of all, of the seven, three do not originate in the region: Telenor is Norwegian, Ooredoo is Qatari and Vodafone is British. More interestingly perhaps, those groups that are regional do not originate in the leading telecom countries of the region: no Chinese conglomerate, nor Japanese, South Korean, Australian or New Zealander. There are essentially two reasons for this: first, the most developed countries in terms of telecoms (Japan, South Korea, Australia, New Zealand) are actually structurally very different from the rest of the Asia-Pacific market: universal wireline service has existed there for a long time, they have a comparatively low income disparity and comparatively small rural populations (except in China). Most of the rest of the Asia-Pacific market has little to no legacy wireline, a high income disparity (and low average incomes) and large rural populations. As for China, it may have similar characteristics to most other countries in the region, but it is also state controlled, which is not a very exportable feature. It has also been mostly focused on its own massive network modernization although that may change with the announcement of a possible China Telecom driven JV in the Philippines. Instead, the larger regional groups tend to operate from emerging markets and develop into emerging markets. Axiata is based in Malaysia and has ownership or control in its operations in Malaysia, Indonesia, Sri Lanka, Bangladesh, Cambodia and Nepal. It also has minority shares in India and Singapore. Viettel operates out of Vietnam and has operations in Myanmar, Laos and Cambodia. Hutchison and SingTel look a bit more like exceptions, in that they originate in small developed markets (respectively Hong Kong and Singapore) and have a mix of investments in developed and developing markets. They also have a bigger tendency than the other groups to own minority shares in developing market operations. One key difference with the paneuropean players is that most of the panasian groups are mobile only. 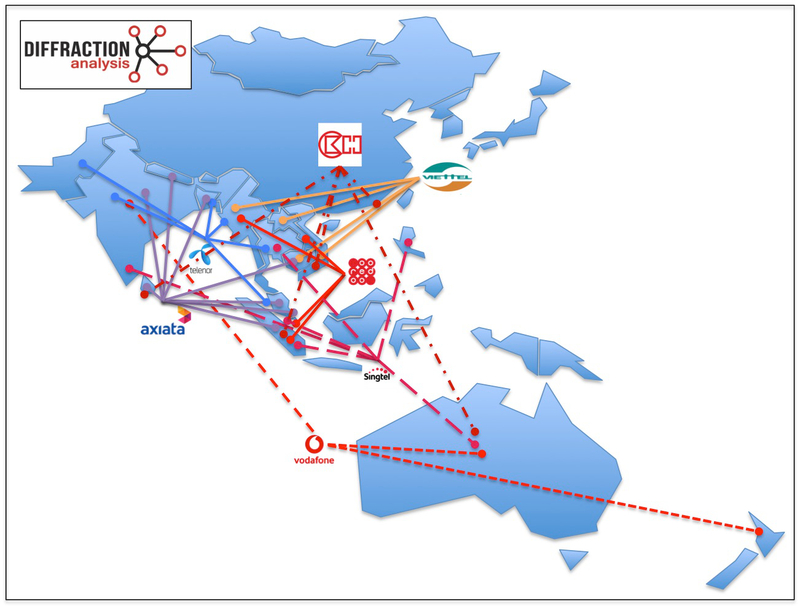 Only Vodafone (in Australia and New Zealand) and SingTel (in Australia) own fixed operations. For Vodafone, this is an extension of their global fixed-mobile strategy implemented a few years ago whereby being a mobile only player in a market isn’t a strong enough position. For SingTel it’s rather an extension of their home business operations. That, however, is where the key to the current panasian strategies may lie, though: while the European market expanded both in mobile (through licence purchase and or transnational mergers) and in fixed (because of a common regulatory framework of copper unbundling) the latter only happened in a very small number of countries in Asia Pacific. As a consequence, international presence is mobile only. This may be about to change, as the deployment of open access fixed infrastructure is on the rise in the region. Following the examples of Singapore, Australia and New Zealand, Malaysia now has a semi-open access fiber network covering 35% of households. Further expansion in Malaysia will likely require co-investment. Similarly, incumbent operators who have initiated fiber deployment in Indonesia, Vietnam, India and Myanmar are finding that in the absence of a co-investment model, the economics are really hard. The new kid on the block, MyRepublic out of Singapore is attempting to take advantage of these developments, with fixed broadband operations in Singapore, Australia, New Zealand and Indonesia. They’re still tiny compared to the other groups mentioned above, but it’s interesting that their development thrust is through fixed networks (and for the most part open access fixed networks) and not mobile (although they are launching an MVNO operation in Singapore and have announced the same in other countries). The lack of open fixed access and aggregation in many markets in Asia Pacific is likely to become a larger issue in the coming years as 5G deployment requires considerable amounts of fixed assets to be deployed. The high density of cell sites will either give an unsurmountable advantage to players who own such assets but don’t share them (and competition will suffer) or bar 5G deployment entirely as the economics for a single market player simply will not stack up. There is, therefore, one theme that should be at the heart of Panasian strategies and could precipitate investment and initiatives in both fixed and mobile, and that is shared infrastructure. Many policy makers and regulators have been talking that talk for a number of years, but when it comes to walking the walk, not much (and certainly not enough) has happened. I’m hoping this will get discussed extensively at Broadband Asia in Bangkok on April 24-25th.